CNET — This online tool aims to get pledges toward gender parity Filmmaker Tiffany Shlain asks people watching her new movie to imagine what the world would be like if it were gender-balanced. Read full article here. NBC Bay Area — 50/50 Day: Gender Equality Events Take Place in San Francisco A global day of action and conversation about gender equality, 50/50 day, is on Thursday, April 26, and organizers are holding events around the Bay Area to promote equality across the globe. Read full article here. WHYY (NPR Philadelphia) — Recalling 1992’s ‘Year of the Woman,’ Lynn Yeakel assesses gender equality in 2018 With hundreds of women campaigning for Congress or other elected office following President Donald Trump’s victory, 2018 has been called the “Year of the Woman.”But 1992 was also dubbed the “Year of the Woman.” Read full article here. CNN — The full history of women’s leadership hasn’t been toldI’d always thought of myself as a feminist, well-versed in women’s history. But I discovered my knowledge of it was more limited than I realized when I met Laura Liswood in 2015. Read full op-ed here. Refinery29 — 11 Famous Women On The Importance Of Gender Parity April 26 marks the second annual 50/50 Day, a global day centered around the goal of achieving a gender-balanced world across all races, ages, issues, and industries. Read full article here. Refinery29 — Women Fighting for Gender Equality If you just look at the numbers, it doesn’t seem like we’re going to hit gender equality anytime soon: In 2018, there are only 24 female CEOs of Fortune 500 companies (that’s 4.8%) and just 105 female members of congress (that’s 19.6%). Stats also suggest we ain’t hitting pay parity ‘til a century after we’re dead (or 2152 if you prefer to be more specific.) Read full article here. Refinery29 — Women Have To Save Twice As Much As Men To Retire Women make up about half of the U.S. workforce. We own almost 12 million businesses. A full 40% of us are the breadwinners in our households. By most metrics, we’ve come a long way to claim our place in the economy. Read full article here. Education Dive — Leading Thoughts: Let’s make gender equity in higher ed a priority Nearly 100 colleges and universities and even more K-12 districts are joining a public campaign to advance gender equity across the globe today for 50/50 Day. Read full article here. Baltimore Sun — Carroll Community College to host gender equality film and panel Carroll Community College is participating in Let it Ripple Film Studio’s 50/50 Day on Thursday, April 26, to promote gender equality with more than 30,000 venues across the globe. Read full article here. Maui News — Local Briefs: Second 50/50 Day event opens in Paia There will be a free community lecture about the Daniel K. Inouye Solar Telescope being built on the summit of Haleakala at 6:30 p.m. Friday at the Maikalani University of Hawaii Institute for Astronomy Advanced Technology Research Center in Pukalani. Read full article here. The West Milford Messenger — Township to Engage in 50/50 Day on April 26th The Township of West Milford officially proclaimed April 26, 2018 as 50/50 Day, a day where communities across the globe are encouraged to have discussions about gender equality. Read full article here. San Francisco Chronicle — Thursday: Women in Politics for 2nd Annual 50/50 Day Women in politics: A panel discussion on Bay Area women in politics. Part of the second annual 50/50 day. 6:30-8:30 p.m., Mechanics’ Institute. Share My Lesson — Join Schools Around the World for 50/50 Day on April 26 What would the world be like if it were more gender-balanced? How would it change our schools, homes, our communities and even our planet? 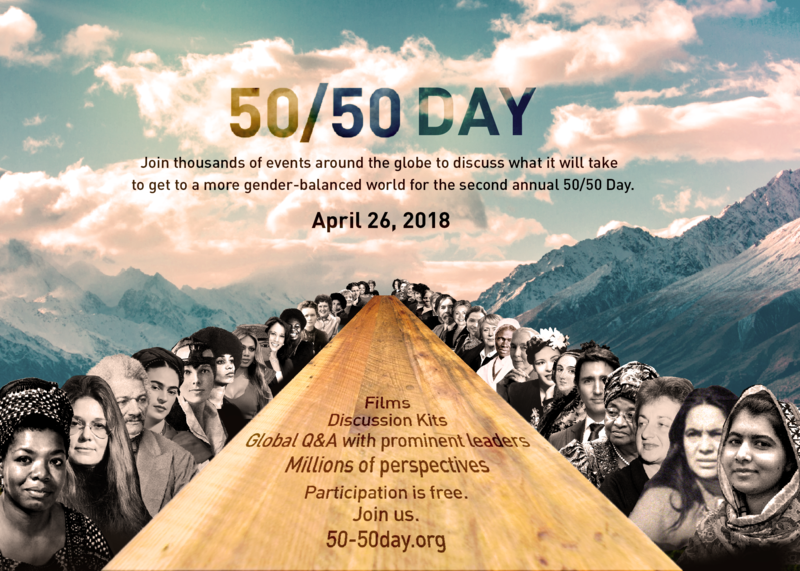 National Post — 20,000 Events at Schools and Companies Worldwide to participate in 50/50 Day on April 26th, a Global Day of Action for Creating a More Gender-Balanced World People at more than 20,000 events at schools, companies, and organizations worldwide will participate in 50/50 Day 2018 (April 26), a global day of action where participants will make pledges for moving closer to gender equality in their governments, businesses, cultures, schools, and homes. Read full article here. 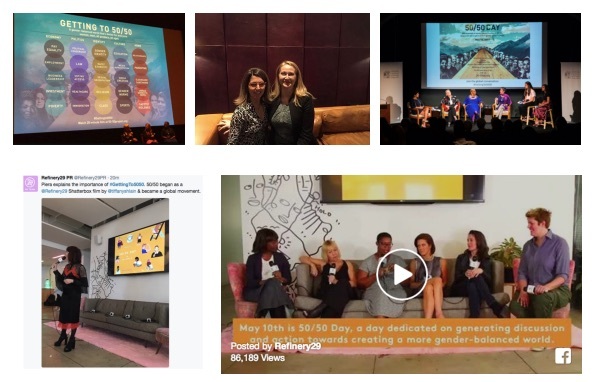 Forbes — Schools Support Gender Equality With Events, Film Screening On 50/50 Day on April 26th Last year, Sarasota Military Academy in Sarasota, Florida, participated in 50/50 Day, a global day of action dedicated to moving the world closer to gender equality. The students were so inspired that the school started its first Equality Club to support female students interested in becoming leaders in their school and community. Read full article here. 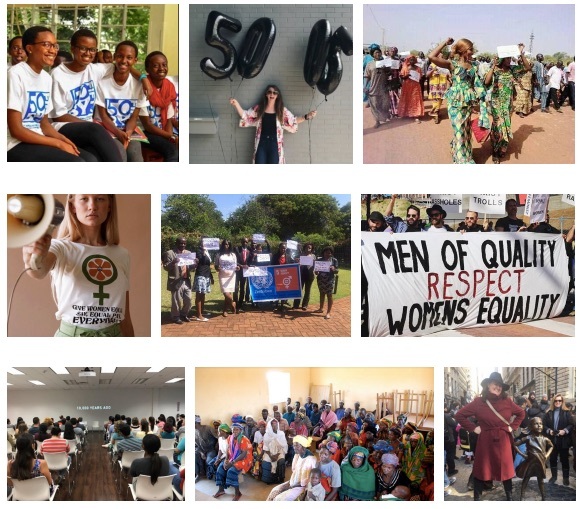 BusinessWire — 20,000 Events at Schools and Companies Worldwide to Participate in 50/50 Day on April 26th, a Global Day of Action for Creating a More Gender-Balanced World. Read Full Release here. NPR Forum Radio show: Michael Krasny Interviews Tiffany Shlain about Global Push for World-Wide Gender Equity. Marin J: Documentary explores history of women’s struggle for power. Read more highlights from the first annual 50/50 Day here.